In the 2013 shutdown, which lasted 16 days, back pay for furloughed feds was not guaranteed until lawmakers struck the final deal to fund agencies and reopen government. Even then, most furloughed federal workers only received their retroactive pay on their next scheduled paycheck. While the government reopened on Oct. 17, they did not collect their wages until Oct. 25. Lawmakers are starting to prepare for a government shutdown, and they want to make sure federal employees are taken care of if the ensuing furloughs come to pass. Sen. Ben Cardin, D-Md., on Wednesday introduced the 2015 Federal Employee Fair Treatment Act, which would guarantee that employees forced to not work and forgo pay eventually receive their normal salaries. While federal statute forbids federal employees from receiving pay during an appropriations lapse, Cardin’s bill would ensure furloughed feds are paid retroactively as soon as possible after the government reopens. Cardin’s bill seeks to change that process, requiring agencies to issue back pay immediately upon the government’s reopening rather than waiting for the regular pay cycle. The Interior Business Center, which handles payroll for 240,000 federal employees, sent out retroactive pay a week before the regularly scheduled Oct. 29 paychecks went out. The legislation would also require the “as soon as possible” payment for “excepted” workers, who are forced to work without pay during a shutdown but are guaranteed back pay. In 2013, about 900,000 federal workers were initially furloughed, though that number decreased significantly when then Defense Secretary Chuck Hagel recalled most of his furloughed civilians during the first week of the shutdown. About 60 percent of the federal workforce reported to work while facing delayed paychecks, as their jobs were deemed essential to protecting life or property or their salaries were paid by funds not subject to annual appropriations. On the eve of the shutdown, Congress separately guaranteed the on-time delivery of military paychecks during the appropriations lapse. Democrats also supported legislation to provide retroactive pay for civilian feds prior to the last shutdown, but the guarantee was not made until the shutdown ended. 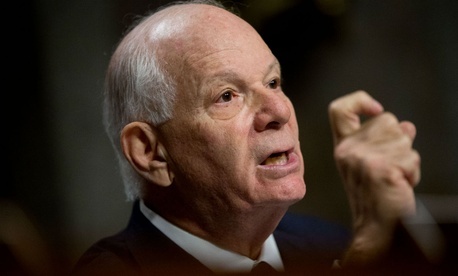 Federal employee groups praised Cardin’s legislation, but said they are still working to avoid a shutdown altogether. Lawmakers have until Oct. 1 to stave off a shutdown. The normal appropriations process has stalled, with the White House and Republican leadership in Congress far from reaching an agreement on spending levels. President Obama has promised to veto any appropriations bill that does not raise funding above the caps established by the 2011 Budget Control Act. Further complicating matters is a push from conservatives in Congress to vote against any spending bill — short or long-term — that maintains funding for Planned Parenthood. Senate Minority Leader Harry Reid, D-Nev., on Tuesday called for a short-term continuing resolution to give congressional negotiators time to strike a budget deal that avoids a sequester. White House Press Secretary Josh Earnest said on Tuesday the Obama administration is still pushing for a long-term deal that boosts spending levels, but would not rule out the president signing a CR.